NOTE: This article is the first in a new series about storytelling. Check back later in the month to learn How to Surface Stories in Your Organization and How to Be a Better Storyteller. In our stressful daily work as communications professionals, it’s easy to forget that we’re ultimately trying to make human connections. We get distracted by numbers, scale, and click-thru and bounce rates. In the end, we’re all trying to tell human stories about humans to other humans. And humans are complex, emotional creatures. Let’s start with a hypothetical auction. In 2009, a journalist named Rob Walker bought 200 small items from eBay. The average price per item was only $1.25. What was the difference? What made this “thrift store junk” sell for a 2800% profit? The difference was the stories. Unsolicited Opinion #1: Nonprofits don’t tell enough stories. I recently took an informal poll of nine of my coworkers, asking them to name the first charity that came to mind. They produced a list of major players—including national and international health charities, food banks, community-building groups, and social justice advocacies. These are all wonderful, important charities—many of them with enormous (by nonprofit standards) communication budgets. And yet half of them talk almost solely in claims and stats and big ideas. They aren’t telling stories and/or they aren’t putting stories front and center. And they aren’t alone. A recent report from Network for Good talked to 400 nonprofits about how they’re using stories in their organization. While 82% of respondents claimed to be using storytelling in their fundraising materials, only 55% said that stories had increased their fundraising to some degree. Now, this survey doesn’t take into account how well the organizations are telling stories. It would be interesting to see if the 27% that aren’t seeing an increase have the stories buried deep in their websites. This might be the reason for their lagging fundraising results. Opinion #2: Nonprofits too often substitute data and claim-making for storytelling. 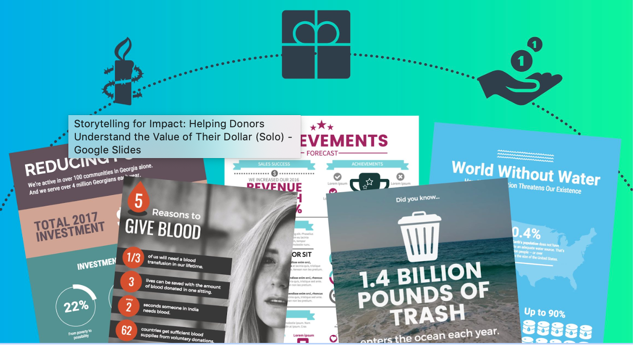 Nonprofits are increasingly good at collecting and sharing data—in the form of infographics, annual reports, and statistics sprinkled across their fundraising emails. But data isn’t a story. It doesn’t have a relatable hero. And what’s worse: Infographics and data usually don’t offer us any context. They don’t help the prospective or current donor understand why the numbers matter. Take this example: What if I tell you that 35,000,000,000,000 gallons of rain fell in Texas in May 2015? While this information might be true, it doesn’t mean much. It’s not a relatable number for most people. We don’t have any sense of how much water that is. But what if I tell you we got enough rain to fill California’s 200 largest reservoirs 3X to capacity? That’s a little better. Or what if I say that was enough water to supply the entire world’s population with 10,000 days of water if everyone drank eight 8-ounce glasses per day? Suddenly, the number comes alive. Both of these examples provide a framework for understanding just what a massive amount of water that is by putting it into a familiar context. The gist is: If you’re going to share data, and you should, try to connect it to something your users understand. Otherwise, the emotional impact is negligible. Opinion #3: When nonprofits do tell stories, the stories often seem to repeat themselves. This is an expected challenge. For example, if you’re a charity that provides health care to children with chronic diseases you probably often find yourself telling the same story about a child who got sick, was helped by the organization, and is now doing well. It’s a good, meaningful story. But is it the only one you have to tell? Are you burning out your audience, or missing an opportunity to widen the net and deepen your connection with donors and volunteers?